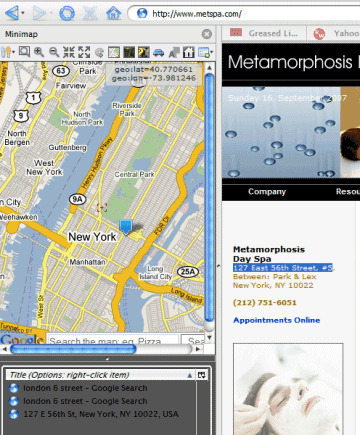 Mini Map Sidebar is probably the greatest Firefox extension for maps and geographical information. Its simple interface hides a lot of powerful tools that help you find places directly from your browser's sidebar. The sidebar lets you drag and drop addresses from the current web page, search the map, get the latitude/longitude, embed the map or send a link by email. It's also easy to switch from Google Maps to Yahoo Maps, Windows Live Local or Google Earth. You always have a list of recent addresses, so you can go back to another address with just a click or select them when you want to get directions. The extension also adds two options in the contextual menu that let you open the selected address in the sidebar or in a new tab. Other interesting features: geodiscovery (if a page has geotags, you can view the locations - for example: some Flickr photos), preview KML files before opening them in Google Earth, find places reviewed at Platial and Tagzania. Overall, the extension is very useful if you need to map a lot of places and opening Google Maps in a new tab is too time-consuming. Finally an alternative to maps.yahoo.com. The idea of draging instead of typing sounds very interesting. I am just loving Firefox and all its plug-ins more and more as days go by.